It takes a year to plan the 9-hour live coverage for the Grammy Awards, which this year served 7 million view sessions. Here’s how Akamai, All Mobile Video Digital Media, and a team of over 100 people put it together. “This is an exciting show to work on, not only because it’s an awards show, but because it’s an incredible concert,” says Joe Einstein, vice president of technical services and operations at All Mobile Video Digital Media. Einstein is smiling in the Los Angeles sun outside the Staples Center, 2 days before the 57th Grammy Awards. Indeed, Einstein and his 50 crew members are all remarkably relaxed with less than 48 hours until their biggest event of the year, the 9-hour-plus Grammy Live webcast, which covers everything from celebrities on the red carpet to the Grammy Premiere awards ceremony to artist interviews and an audience cam during the main event, not to mention a wrap-up show after the awards. Of course, it’s the kind of calm that only comes from having done such a big event every year for the past decade, and from a team that plans accordingly. Einstein—first with AEG and now with AMV (All Mobile Video bought AEG in 2014)—has worked on the Grammy Awards for 10 years and has been running the webcast from a mobile unit for the past 3 years. “Every year we’ve been refining it from both a content standpoint and a technology standpoint,” he says. 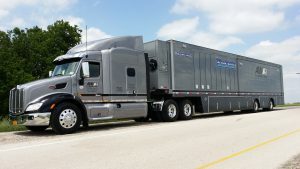 “We start planning next year’s the day after this one is done,” says Bill Wheaton, senior vice president and general manager of the media division at Akamai, the CDN that takes the feed from All Mobile Video and delivers it to PCs, connected televisions, and hundreds of types of mobile devices. Einstein adds that preparation for Grammy Live really ramps up about 4 months ahead of the February event, which this year drew more than 1.2 million total users and more than 7 million view sessions. The biggest change for 2015 was to turn the webcast into an “information-based” event, according to Miranda Eggleston, who handles clearances and releases for the Academy and, as a producer for Grammy Live, literally calls the shots in the AMV truck during the webcast. 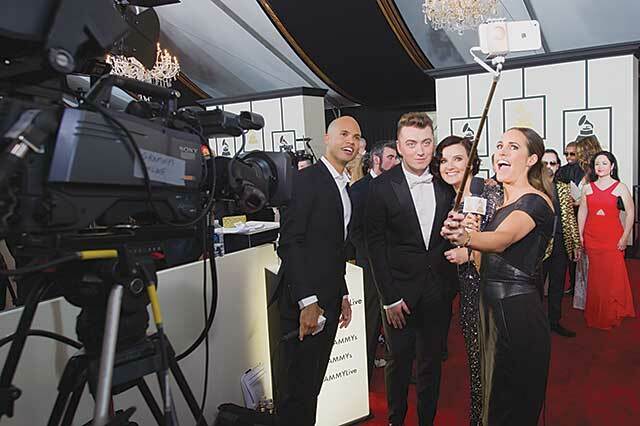 “Instead of competing content, we had companion content,” she says, with trivia, fun facts, social media posts, and questions from fans, giving webcast viewers a second-screen experience to keep them engaged during the Grammy telecast. Over the years, the Grammy Live team has looked at numbers from previous events to continuously improve their programming and give viewers what they want. During the course of the past few years, they’ve determined that the red carpet coverage—which includes dozens of celebrity interviews by Grammy Live cohosts Quddus and Louise Roe—and the Grammy Premiere Awards ceremony—at which the vast majority of awards are announced, including all of the international categories—drew the most viewers. 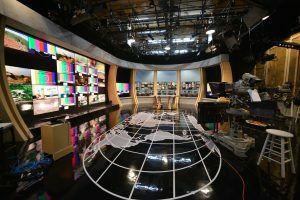 At any point during the webcast’s 9 hours, viewers could choose from one of four camera angles to play in the main window, while thumbnails of the other angles played below. So a viewer could watch the presentation of the Best Latin Pop Album at the Premiere ceremony in the main window, while keeping an eye out for that Sam Smith interview and checking out Taylor Swift’s dress in the thumbnails.